Students worked with teachers, artists, and alumni to examine and share the story of Carver High School from 1948-1970. Discover how Partners in the Arts has been engaging and empowering educators to teach to their students’ strengths and demonstrate learning through the arts since 1994. This presentation introduces the creative and integrated instructional processes educators can use to curate and present evidence of student learning to stakeholders in K-12 education. Dr. Lisa Donovan, professor in the Fine & Performing Arts department at the Massachusetts College of Liberal Arts and recently named adjunct assistant professor at the University of Richmond, will headline this presentation. Donovan's current research work focuses on using performance-based assessment to create “learning stories,” helping educators effectively tell the stories of their students’ classroom learning experiences. In addition to Donovan’s presentation, the event includes two learning story case studies, selected from among Partners in the Arts Engaging Creative Thinkers (ECT) award-winning projects. Open High School students have been working with local artists and curators to explore the trans-Atlantic Slave Trade in conjunction with local history and through the lenses of their own strengths and experiences. Carver College & Career Academy (formerly Chesterfield Community High) students captured the school’s civil rights stories past and present by engaging with 15 living primary sources from the building's time as Chesterfield County's segregated high school. Following case study presentations, Donovan will share details of her research including methods empowering educators to curate their students’ learning stories. Case study presenters will join Donovan in a brief Q&A session with audience members after Donovan’s presentation. This event is sponsored by by Partners in the Arts and the Graduate Education program as part of the Graduate Education Speaker Series. The event is free and open to the public; online registration is requested. This project combines content areas of History, American Literature, and Art, as students will explore Richmond’s slave trail and racial conflict in America through drumming, dance, drama, and digital storytelling. Students will learn about the trans-Atlantic Slave Trade in conjunction with local history, connecting with local artists and curators. At the end of the unit, students will learn how to express their new knowledge and understanding through digital storytelling in order to personally engage and reflect upon their experiences. This project is a sound exhibition established in 2015 at Community High School (now Carver College and Career Academy). 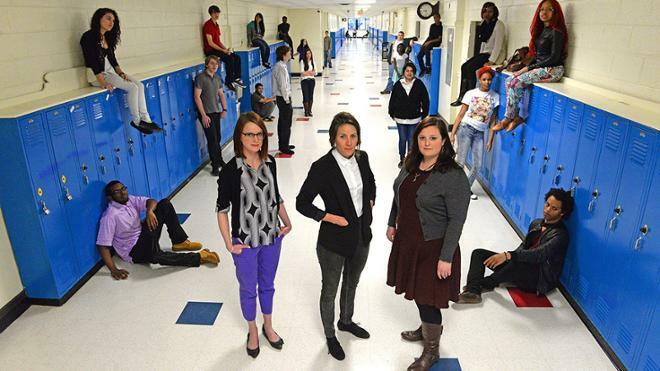 Created with the intent to capture a school's civil rights stories past and present, student facilitators reached out to 15 living primary sources from the building's time as Chesterfield County's segregated high school. Through recording, creating music concrete and developing sound compositions, students developed relationships within the larger community, and found fellowship with each other.In understanding their shared social responsibility to question the meaning of civil rights, students worked to ethically synthesize oral histories of the community and utilize digital media to develop oral and written communication skills.describe how to effectively integrate the arts into core curriculums, and, most importantly, discuss the necessity for authentic, student-driven conversations in the creative and developmental processes.